Can I use a custom domain name that I purchased from a domain registrar? Yes, you can use a custom domain name you already own that is parked (not being used) at a domain registrar and forward it to your Simplecast website. →To use a custom domain name, you will need to modify the DNS Records wherever you purchased the domain (Instructions below). This will include editing the CNAME for 'www' and adding 3 A-Records (instructions below). →Every domain registrar is set up a little different. If you are not sure how to manage the DNS Records or need additional help, you can always reach out to us in support via the chat window or contact your domain registrar directly. →In this article, you will see www.yourcustomdomain.com. This is only an example. You will replace this with your custom domain name. →You will start by modifying the DNS Records and then return to your Simplecast dashboard to finish the setup of your custom domain. 1. Log in to your domain registrar account (e.g., GoDaddy, Hover, NameCheap, Google Domains), then locate the DNS settings or management page for your custom domain. Look for an existing CNAME record for www and click pencil to edit. If there is no existing CNAME record for www, click 'Add' and select CNAME. Want to learn more about CNAMEs? 4. Add A-Records You need to add three (3) A-Records in order to use your root domain (yourcustomdomain.com) in addition to using a sub-domain (www.yourcustomdomain.com) If you only want to use a sub-domain you can skip this step. Do not edit or delete A-Records for Mail or Email as it could interfere with your email service. DNS Settings may look different for each registrar. This is GoDaddy. Note: It could take a few minutes or a couple hours before your custom domain is properly forwarding to your Simplecast website, but give it a little time and feel to reach out to our support team with a screenshot if you're uncertain about your CNAME or forwarding settings. Open a new tab or window in your web browser and type in yourcustomdomain.com or www.yourcustomdomain.com. 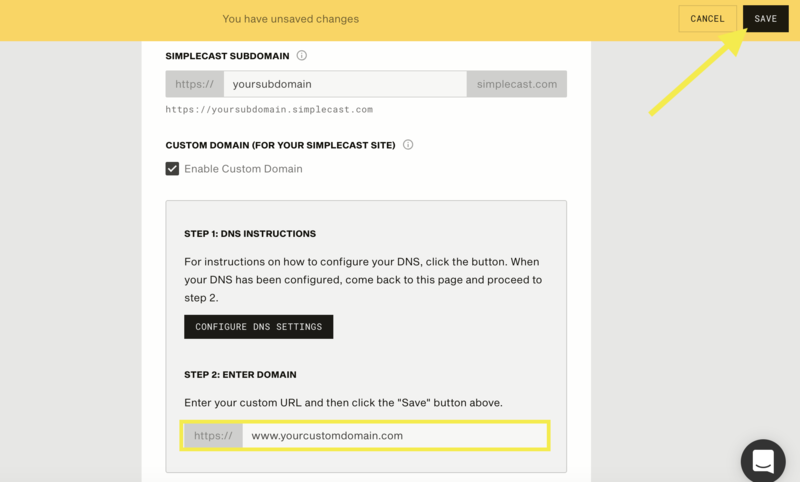 Your Simplecast website will open if your DNS settings are configured correctly. Does Simplecast support HTTPS/SSL for custom domains? Yes. Once you configure your custom domain in 'Site Settings & Design' and modify your DNS records, we provide you with a free SSL Certificate (https://) for all custom domains automatically and no additional configuration is required. Seriously. When visitors to your site type in www.yourcustomdomain.com they will see https://www.yourcustomdomain.com in the address bar which will give them peace of mind knowing your Simplecast site is safe and secure. Note: Modern web browsers do not require you to put https:// when typing in a web address, but will be in the address bar after the website loads.